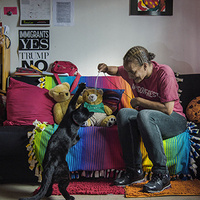 The goal of this exhibit is not just to show that recovery is possible, but also to highlight some of the ways people have rebuilt their lives: reconnecting with their families, finding rewarding work, developing meaningful relationships with partners, peers, and others who offer support. We also wanted to feature some of the treatment providers and harm reduction services that many people rely on, often at times when they feel isolated and overwhelmed. Recovery is rarely a solo journey and it usually involves setbacks and hurdles, but the more we talk about it, share ideas, and embrace different paths, the more people will find their way. Graham is a photographer and assistant professor at Parsons. Susan is a reporter and adjunct professor in the Journalism + Design department at Eugene Lang College/The New School. They have collaborated on projects combining interviews and photography, including exhibitions, talks, and a memoir documenting Graham’s addiction, incarceration, and recovery. Contributing Artists: Nina Berman, Allan Clear, John Donadeo, Yannick Fornacciari, Tony Fouhse, Paul Gorman, John Linder, Luceo, Graham MacIndoe, Josh Meltzer, Jackie Neale, Neil Sneddon, and Susan Stellin. Student Projects, supervised by Graham MacIndoe and Julia Gorton, assistant professor of communications at Parsons: Sara Akiki, Carly Bayroff, Scoutt Palframan, Ellie Plass, Josie Stevenson, and Lucy Xin. Thanks to: Luke Hayman and Elyanna Blaser-Gould at Pentagram Design, Hashem Eaddy, The National, the Open Society Foundations' Global Drug Policy Program, and everyone who worked with the artists and shared their stories. Drug use and addiction have long been treated as a crime in the U.S., but with record numbers of people dying of overdoses and legally prescribed medications implicated in many of those deaths attitudes are beginning to shift. Yet decades of media coverage and laws reflecting a drug war mentality may take longer to change. Panelists will discuss how art, media, research, and advocacy can influence how we respond to problematic drug use—through treatment, harm reduction, and other services—and help people rebuild their lives after addiction. Pedro Mateu-Gelabert, PhD, Principal Investigator and Deputy Director, Institute of Infectious Disease Research., National Development Research Institutes, Inc.